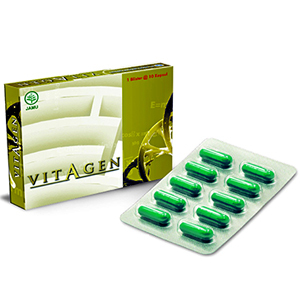 Vitagen is a herbal formulation that is extracted with proper and safe composition of several types of herbs that are well known for its efficacy and multiple properties such as Centella asiatica, Nigella sativa, xanthorriza Curcuma, Curcuma longa Linn and turmeric. The Herbal plants contained in Vitagen have different active compounds and content but they are synergistic and constructive (build and repair) so that they can complement each other, supports, and strengthens their usefulness. Vitagen is produced by using high-tech, all the raw materials have gone through a rigorous selection process and are safe for consumption. The main raw material is Centella asiatica, Nigella sativa, Curcuma Xathorrhiza, and Curcuma Longa Linn turmeric extracts, passing through micro test and then mixed evenly in accordance with a predetermined composition, before being put into capsules. The process is continued with blistering so that Vitagen can be taken and consumed at any time. For children who had difficulty swallowing capsules, Vitagen can be mixed in fruit juice, honey or vegetables. Before widely sold in the market, Vitagen have passed the final test by BPOM and obtained the license with Registration Number POM TR 123 364 941 for blister packaging. Membantu meningkatkan daya kerja otak dan mempertahan ingatan (brain tonic) serta konsentrasi. Membantu merevitalisasi otak dan tubuh yang lelah karena belajar, konsentrasi dan bekerja. 1. Meningkatkan imunitas (kekebalan tubuh) sehingga tidak mudah terserang penyakit. 2. Meningkatkan antibodi, menurunkan kolesterol dalam tubuh, dan menjaga kesehatan jantung, dan organ-organ tubuh lainnya. 3. Antioksidan, menetralkan racun dalam tubuh, memperbaiki saluran pencernaan, anti alergi, anti radang, anti bakteri dan anti anemia.